As we continue to ramp up for this weekend's Nobel festivities, it's time to take a look at one of Queen Silvia's favorite tiaras, and a regular star at the Nobel ceremony: the Leuchtenberg Sapphires. This gem has a provenance similar to another huge Scandinavian diadem: Empress Joséphine's Emerald Tiara, now in the possession of Norway's royal family. 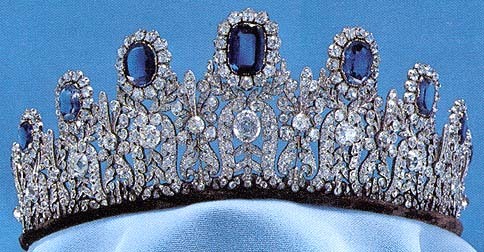 The sapphires are thought to have been a wedding gift from Napoléon to Princess Augusta of Bavaria, Duchess of Leuchtenberg, when she married Eugène de Beauharnais (Empress Joséphine's son). It makes the journey to Sweden with Augusta's daughter, Josephine, who was the Queen consort of Oscar I of Sweden and Norway. The parure is now in the family foundation in Sweden, and has been worn mostly by queens and those acting as first ladies of the country, though there are exceptions to that rule: one being when King Carl Gustaf's sister, Princess Birgitta, wore it for Carl Gustaf and Silvia's pre-wedding ball in 1976. Birgitta's outing of the sapphires was the last time they were worn by anyone other than Queen Silvia (to date). She's made this one of her staples, and has explored all sorts of color combinations with the luscious blue sapphires. Composed of 11 sapphires framed in diamonds on a diamond base of honeysuckle and leaf motifs, it was probably made by the Parisian jeweler Marie-Etienne Nitot. It's a very flexible piece, both in stones and in shape. Originally, pearls were included as an alternative to the sapphires. The pearls have left the family line now, but the attachment capability is still there. They could get new pearls and restore the old version, which would be great since the whole giant Swedish tiara collection really doesn't have a great hefty pearl piece. It's also flexible in form: the tiara is comprised of 11 separate sections, meaning you can adjust the circumference to suit your needs (it even stores flat in its case, which is quite interesting). This tiara is large and surely has a significant weight to it - but it is still a favorite, and I wonder if the flexibility factors into that. Surely the ability to form it to suit your head shape makes for a more comfortable tiara-wearing experience. The tiara is the headliner in a full parure of jewelry. Today, that parure is composed of the tiara, earrings, a necklace, a brooch, and two hairpins. 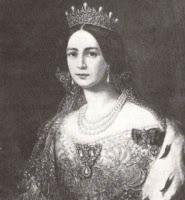 The earrings are relatively new to the set: Queen Victoria didn't wear earrings, so she either gave the originals away or had them remade into something else. Queen Louise (as Crown Princess) converted two of the four original hairpins into a set of earrings to complete the parure once again. It's not only a fine example of craftsmanship and ingenuity in construction, but a wonderful example of superior stone quality in the deep blue sapphires. With so many options available, and such a grand parure to play around with, it's no wonder Queen Silvia wears it so frequently. I say keep it up, Your Majesty! How does this one rank on your list of favorite tiaras?